Former pharmaceutical chief executive Martin Shkreli has been found guilty of three counts of securities fraud. A New York City jury cleared the 34-year-old on five other counts after a week of deliberations. He was tried in relation to a drug company he previously headed and a hedge fund he managed. Shkreli was branded "the most hated man in America" in 2015 when his firm hiked the price of a lifesaving medication used by Aids patients. Despite facing prison after being convicted of two counts of securities fraud and conspiracy to commit securities fraud, Shkreli professed himself pleased with the outcome. Standing outside the court in Brooklyn, he said: "This was a witch hunt of epic proportions. "And maybe they found one or two broomsticks but at the end of the day we've been acquitted of the most important charges in this case and I'm delighted to report that." Shkreli rocketed to notoriety in 2015 after raising the price of an anti-parasite drug called Daraprim by 5,000% upon acquiring rights to the medication. Overnight, the cost of the drug soared from $13.50 to $750 per dose. Over the course of a five-week trial, jurors heard how Shkreli lied to investors about the performance of two hedge funds, MSMB Capital and MSMB Healthcare. He then stole from Retrophin, his pharmaceutical company, to pay investors back, prosecutors said. 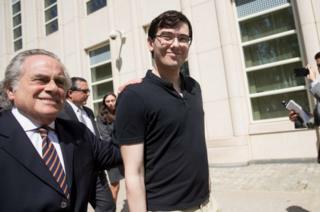 "Martin is a brilliant young man," his lawyer, Benjamin Brafman, said after Friday's ruling. "Sometimes, people's skills don't translate well," he told reporters, acknowledging that his client suffers from "an image issue". During the trial, the attorney portrayed his client as a misunderstood "nerd" who turned up at work wearing a doctor's "stethoscope and bunny slippers". One investor had testified that Shkreli reminded him of Dustin Hoffman's autistic savant character in the movie Rain Man. His defence attorney even quoted a song title by the pop star Lady Gaga to say Shkreli "was born this way". "You wanna call him names? Call him names. Just don't call him guilty. Cause he's not guilty," Mr Brafman argued in front of the jury. Shkreli's negative press was so widely known that it took the court three full days just to find 12 jurors who did not have a pre-existing opinion of him. Several prospective jurors were dismissed after referring to him as "a snake" and "an evil man", the New York Post reported. Judge Kiyo Matsumoto felt obliged at one point to issue a gag order, after Shkreli surprised reporters during a lunch break by ranting against enemies whom he said were trying to "blame me for capitalism". The so-called "pharma bro" often vented his spleen on social media, eventually getting himself banned from Twitter after harassing a female journalist. He often appeared to revel in the negative publicity he received. Shkreli was also admonished after refusing to answer questions during testimony to congressmen, whom he later called "imbeciles". In a bizarre coincidence, another man who is also named Martin Shkreli was arraigned before the same Brooklyn judge on Friday. "There's another Martin Shkreli in this case. How weird is that?" quipped one lawyer during the court proceedings. The other Mr Shkreli, 59, is accused of money laundering. He told reporters about his younger namesake: "I don't need that kind of fame."